In Round Rock, as in most areas, it is more than an annoyance when something goes wrong with your garage door. But, even though the city is located some 20 miles north of Austin, there is no reason not to get good service when you need quick garage door repair. Action Garage Door service personnel respond promptly to calls for help, whether it’s an emergency that has you unable to back out of your garage or a broken cable that keeps you from opening the door to get your car inside. We have the necessary tools and replacement parts on our service vehicles; at the very least, we will give you a binding estimate immediately and schedule the actual work at a convenient time. For more than 30 years in the business, we have been providing quality service to Austin area homeowners and businesses. We are proud of our record and even more proud of our competitive prices and full warranties of labor and materials. When you need minor repair, look no further than Action. And when you are ready to discuss options for replacement doors and alternatives for a newly-constructed home or business, we are available to help you decide what is exactly right for your needs. We are dedicated to helping you make your home or Round Rock business the very best that it can be. At Action Garage Door, we understand you have many needs when it comes to garage door service. 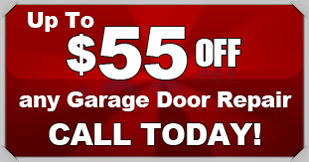 If you are looking for superior garage door repair in Round Rock, TX, Action Garage Door is your answer. Garage door repair is complex and should be done by the professionals. Our garage door repair specialists are there to provide top-notch service where and when you need it in Round Rock. 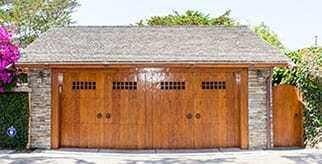 We have over 30 years of repairing all types of garages. From residential to commercial, we have you covered. We take our repair service a step further than other companies. Aside from our repair service being the best in the market, we seek out the highest quality parts to use in your repair. Action Garage Door is committed to customer satisfaction in every service we provide. It isn’t a question of why people in Round Rock refer their friends and neighbors to us at Action Garage Door. Contact us for your garage door repair needs. At Action Garage Door, we love to add value to Round Rock homes and businesses. Nothing can add a “wow” factor like a new garage door. A lot of people underestimate the impact a garage door can make until they see one that is poorly done. You can add warmth to your home instantly with a classic wood garage door. Add strength and durability to your business with a steel door. No matter what door you choose, Action Garage Door has the knowledge and expertise to install it and maintain it for you. No two home or business owners are alike, and our garage door repair company understands that no two will want the exact same garage doors and set up. At Action Garage Door, we offer a variety of garage doors for installation in Aledo homes and offices. Some of our options include steel, wood, Carriage House, Olympus, Stratford/Heritage, and Amarr. To get started with your garage door repair, installation, or replacement, contact Action Garage Door in Round Rock today and let’s talk about the options available from the garage door repair company that has been caring for customers since 1984. Austin’s suburb of Round Rock is, in every way, a fine place to call home or to transact business – it is known as a suburb only because of its proximity to “the big city,” but it is some 20 miles north and has a totally different personality. “The Rock,” with a population of 122,727 at the 2016 city census, is a city worth note in anyone’s book. In 2008, Round Rock claimed the number seven spot on Money Magazine’s list of Best Small Cities, the only Texas city recognized; then, in 2009, it achieved the distinction of being the second fastest-growing city in the nation in CNN rankings. Dell has its international headquarters in Round Rock, employing nearly 16,000 people. A Premium discount mall, and a mixed-use development known as La Frontera, along with major retail chains like Ikea, bring shoppers as well as residents to the city, and Round Rock has attracted other business through an aggressive economic development program and favorable tax incentives. The city is justifiably proud of its influx of industries in clean energy, life science, advanced manufacturing and computer/software development, and has won accolades for its quality of life, “community visioning,” economic growth, and internal management practices. It has a low combined property tax and utility rate, an award-winning school district and recognized as one of the safest cities of its size in the United States. Round Rock was the site of a historic shoot-out between Texas Rangers and train robber Sam Bass in 1878, and the event is reenacted each July during the Frontier Days celebration. Cotton, which brought wealth to the Blackland prairie during the 20th Century, is still grown in the area, along with cattle ranching on a greatly reduced scale. 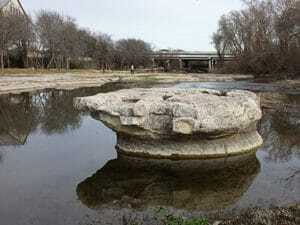 Until the late 1990s, Round Rock and neighboring Georgetown were relatively small bedroom communities of Austin. But the emphasis on economic development has brought renewed vigor to the prairie, and the city now is a prosperous medium-sized city with enviable economic clout. Largely due to Dell’s Texas sales, the city ranks among the top ten cities in the state for sales tax receipts, and that funding is put to good use in future planning and city development. The city is uniquely situated on the Balcones Escarpment, with surrounding topography almost equally divided between fertile Blackland prairie and higher and hilly terrain with little topsoil that is characteristic of the Texas Hill County. It is an abrupt change from one side of the fault line to the other, making for some unique building sites and distinctive homes. Home prices have risen 6.6% over the last year in the city to a median value of $237,500; the median list price per square foot is $124, lower than the Austin metropolitan average of $151. Rents, however, are slightly higher than Austin proper and, interestingly, the real estate market in Round Rock is currently deemed to be “cold,” although prices are predicted to climb another 3.5% during the coming year. That all may mean that it is a good time to buy a home in Round Rock. Round Rock offers a friendly and family-oriented lifestyle. If you’re looking for excitement, you’ll find plenty in Austin and there are enough activities and destinations to keep even the most dedicated outdoor enthusiast happy. But most of the entertainment is to be found near Round Rock rather than in Round Rock. That seems to be just fine with most residents. There are plenty of chances to eat your fill, however, with mom and pop burger restaurants, barbecue joints, local farm-to-table cafes and friendly bistros scattered throughout the city and along I35 all the way to Austin. There is also a local emphasis on arts and culture, with a municipal program to strengthen the local arts community and provide greater opportunities for youth and adults alike in the city. Arts events include gallery openings, local musical performances, a downtown car show and community theater. The city also boasts an active parks and recreation program, with 34 parks, two recreation centers, three outdoor swimming pools and one indoor aquatic center, as well as ball fields, an award-winning senior center, a skate park and a dog park. When you tally it all up, Round Rock is a good place to call home, in all seasons and for good reasons. Great customer service provided by Alfonso " ALF"
Our service guy was excellent! Very courteous and knowledgeable. Arrived on time, work explained and performed promptly. Excellent experience. New Springs Installed And Yearly Maintenance Performed. New Nylon Rollers Installed Also.